This coffee table book is truly a detailed guide to South Indian festivals. "How many times have you sat through a pooja and wished you were somewhere else? How many times have you performed rituals but had no clue why you were performing them? Have you had to call up your mother every time there’s a festival around the corner? If you have been through all this and more, then ‘Follow the Hindu Moon’ is an answer to your prayers! The books are elaborate and are ideal for any urban household considering the fact that while we can find a lot of information in regional language books, this book’s simplicity is endearing. 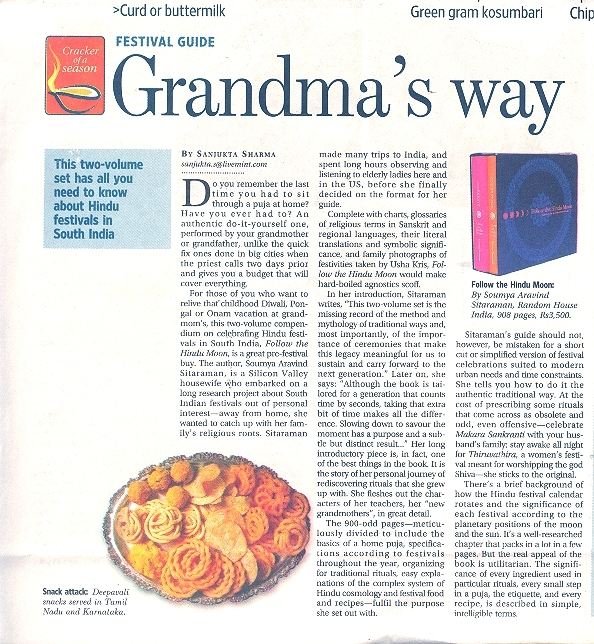 "This two-volume set has all you need to know about Hindu festivals in South India"
"For those of you who want to relive that childhood Diwali, Pongal or Onam vacation at grandmom’s, this two-volume compendium on celebrating Hindu festivals in South India, Follow the Hindu Moon, is a great pre-festival buy." 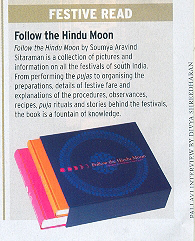 Follow the Hindu Moon by Soumya Aravind Sitaraman is a collection of pictures and information of all the festivals of South India . From performing the pujas to organising the preparations, details of festive fare and explanations of the procedures, observances, recipes, puja rituals and stories behind the festivals the book is a fountain of knowledge. Have lost touch with the tradition? Want to know why your mother insists on drawing a rangoli every festival and tasting five flavours on New Year’s Day or for that matter the significance of turmeric Ganesha that your grandfather used to create when you were young? Help is at hand. Random House has just come up with a tome called “Follow The Hindu Moon”. 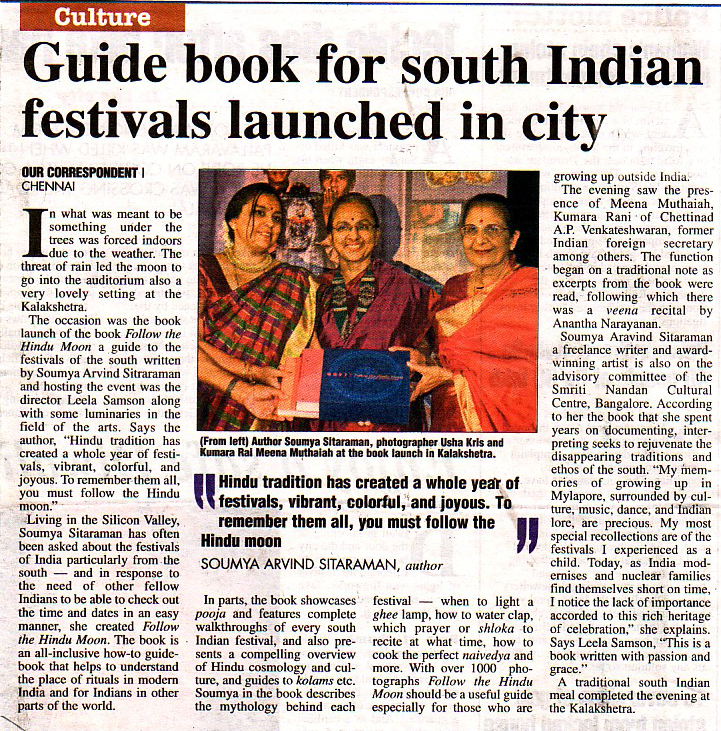 To provide a sumptuous and comprehensive insight into the festivals of South India , writer Soumya Aravind Sitaraman brings the intricate details of the festive favour of Pongal, Onam, Vishu etc all in her new book Follow the Hindu Moon. 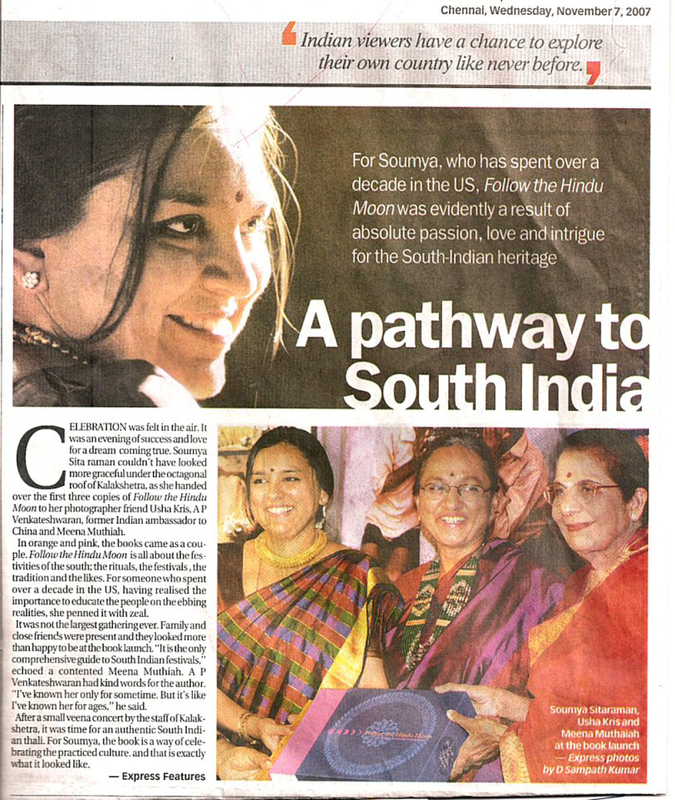 Read on as Soumya speaks about her work, the rich south Indian heritage and the festive mood. "Everything has been put together with a precision that accompanies the handing over of age-old recipes. This, with a presentation that makes it contemporary and easy-to-approach. 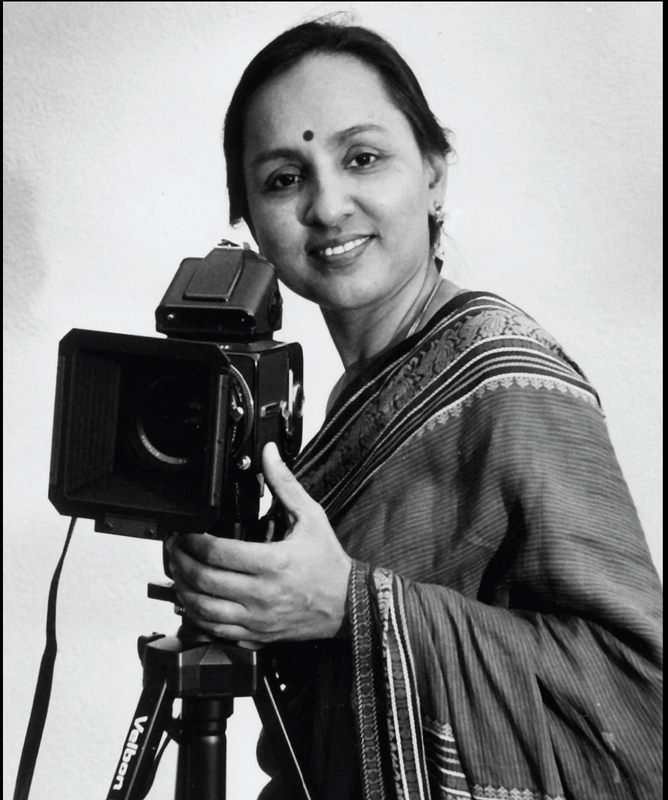 Photographs by Usha Kris provide the visual reference." For someone who has spent over a decade in the US, Follow the Hindu Moon was evidently a result of absolute passion, love and intrigue for the south Indian heritage. "Celebration was felt in the air. It was an evening of success and love for a dream coming true. Soumya Sitaraman couldn't have looked more graceful under the octagonal roof of Kalakshetra..."
'"It is the only comprehensive guide to south Indian festivals echoed the contented Meena Muthiah.."
"The book is an all-inclusive how-to guidebook that helps understand the place of rituals in modern India and for Indians in other parts of the world..."
"Follow the Hindu Moon should be a useful guide especially for those growing up outside India." 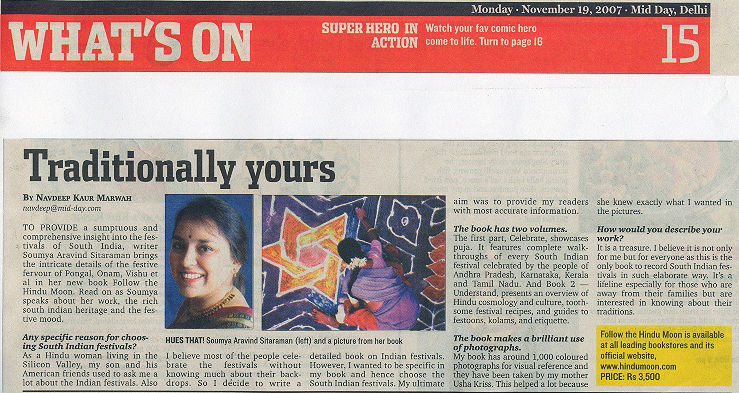 Says Leela Samson "This is a book written with passion and grace"
remind us and the moons that grace the occasion. the physical, but whose invocation is to the spirit. “What are the roots that clutch?” asks T.S. Eliot in his The Waste Land. The answer is the present volume, tome, dictionary, encyclopaedia, compendium, concordance- all in one. Life, indeed, would a “wasteland” without the awareness of one’s own roots. When roots are firmly planted in the fertile ground, the branches many wave and wander about in the winds of the world, anywhere, anyhow. The Hindu mind as always been the most catholic and comprehensive, encompassing all human experience, achieving spacio-temporal transcendence. Every moment is everlasting and eternal – both “Anadi” and “Ananta”. It is this quintessential, omniscient, omnipresent, omnipotent, Universal, Absolute Presence in our daily lives, present in our feasts and festivals, manners and customs, etiquette and behaviour that has been marvellously captured by Soumya Sitaraman in her Follow the Hindu Moon which is a thing of beauty where ancient tradition and faith are rationalized for the modern man. Follow the Hindu Moon is unique. For children there are stories from our Myths and Legends. For the grown-ups there is the mode and method of worship. For the devoted ladies there are the neivedyam recipes. For the philosophically inclined elders, there are the concepts of Space and Time. For the initiated specialists there is astronomy. For the cultured ladies and gentlemen, there is etiquette. For the non-Sanskrit knowing anglophiles, there is English translation. And for foreigners there is transliteration. Suffice it to say, “Here is God’s Plenty” for everyone and there are Gods and Godesses galore. The present voluminous work is two things at the same time – a Dictionary of Symbols and a thesis in social and cultural Anthropology. It is the Indian counterpart of Frazer’s monumental The Golden Bough -but with a difference. “What is a book without pictures?” asked Alice. Here the wonderland of Hinduism reveals itself in this pictorial extravaganza in all its myriad multiplicity. It is said that one picture is equal to a thousand words. There is a photograph on every page, sometimes more than one, meaningfully aligned. Each picture is a gem, designed with loving care and devotion—especially the full- page photographs which are of prize winning calibre. 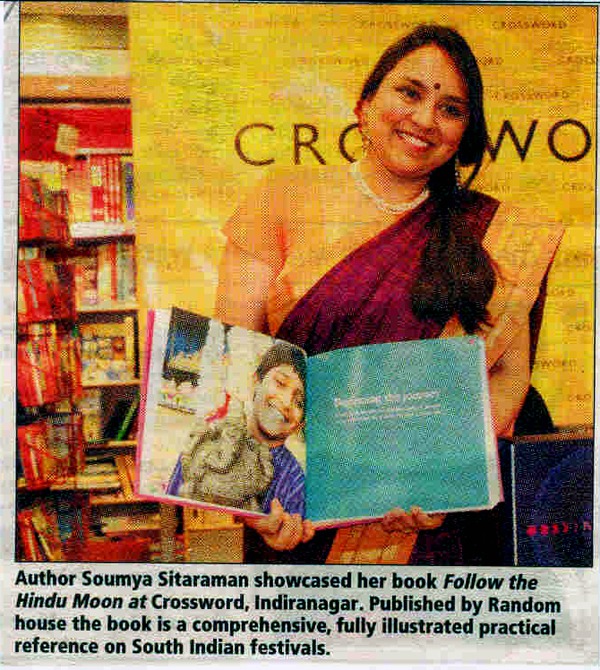 Soumya Sitaraman deserves to be congratulated for providing a collector’s item, a ready reckoner and a guide to meaningful life—all in one—and the volume should be on the shelf of every personal and public library. The Omniscient one has his own chosen instruments for execution of His celestial will. They are necessarily blessed with something extra, something special which will enable them to discharge well the responsibilities delegated to them by Karma, Vaarana of direct Divine dictate. Soumya Aravind Sitaraman is one among that blessed brigade. She has put into amazing use the three H’s nature has bestowed the hand, the head and the heart. In philosophical or spiritual interpretation they represent Karma, Jyana and Bhakti Margas respectively. In this stupendous work, all these three paths are in lavish use. I cannot bring myself to describe it as a “practical guide.” It is a massive tome which throws open with flourish the windows to the festivals and such events that colour the rich Indian Panorama. Step-by-step, the pages reveal the why and wherefore of the celebrations. Highly significant are the pages dealing with the sacred chants, the Mantras and shlokas. 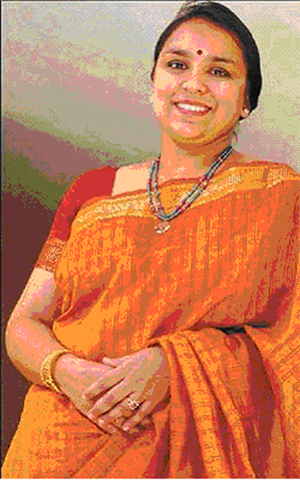 Soumya Sitaraman does not forget to add an essential caution to the uninitiated reader. One whole section deals with Hindu astronomy and part of another chapter talks of time. Both topics are dealt with in awe inspiring elaboration. For those outside the Hindu orbit and unfamiliar with our pantheon of Gods, “who is who” proves highly informative. Convention and cultural norms inclusive of guest hospitality are not omitted. A work of this extensive nature has to be necessarily restricted in selection. For practical reasons the author, herself a South Indian Brahmin, has restricted her journey of joyous exploration to the four South Indian States of Tamil Nadu, Kerala, Karnataka and Andhra Pradesh . Last but certainly not least comes the focus on the breathtaking display of photographs enriching this mega production. Thematic representation apart, Smt. Kris has captured the very essence of charm, colour and decoration in the optical presentation of the objects photographed, whether they be animate or inanimate. Many articles thus covered are rare and exceedingly beautiful. Their placement carried out with casual care enhances the attractiveness of the volume. A gifted mother and a gifted daughter, a grand combination indeed. 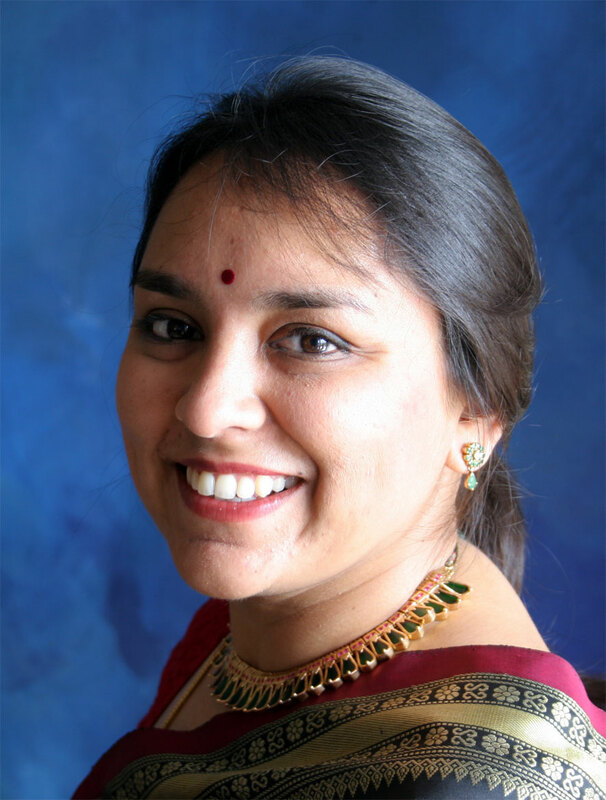 Soumya has refreshed and repainted fading memories and highlighted the glory of our ancient culture which is The author has taken us with her on this incredible, fabulous pilgrimage becoming the meaning and joy contained within. Through this brilliant workour priceless legacy. No words of praise are too much for this contribution she has made. Only one whose heart sings to the melody of joy can transfer it so meaningfully to written expressions and at times word pictures. 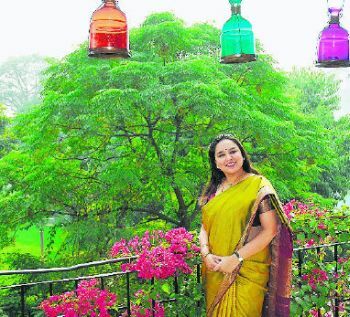 Her choice has happily fallen on the timeless wonder that is India , sacred, joyous and eternal. May the blessings of the Param Purusha (Supreme One) ever be with her and her own. May His thought inspire her to bring forth more and more such sublime offerings as fragrant blooms to lay in adoration at His lotus feet.